Periphery are a band that have really made an impact on the heavy music scene over the last several years. 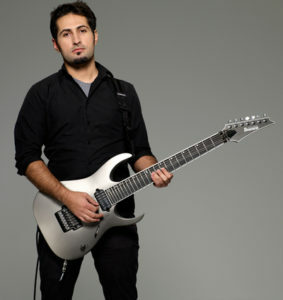 A progressive metal band that probably inadvertently helped spawn the “djent” scene (“The word “djent” is an onomatopoeia for the distinctive high-gain, distorted palm-muted guitar sound” – Wikipedia) , Periphery have amassed a very large following via the Internet, and become a major touring act in the heavy music scene. Jake Bowen is one of three guitar players in Periphery, and has been lucky enough to have DiMarzio make him a signature humbucker set. The Titan bridge and Titan neck humbuckers are named to co-inside with his Ibanez LACS custom shop Titan guitar, which may become a production signature guitar sometime in 2014. With a ceramic magnet and a DC resistance of 11.07 Kohm, the Titan bridge has a interesting blend of high output and low compression. The EQ specifications of 5 (bass), 6 (mids), and 5 (treble), and aforementioned low resistance give the Titan bridge a very balanced tone that works great in a variety of guitars. I loaded the Titan bridge into my custom Ibanez style guitar , which has an alder, maple neck with rosewood fretboard and Gotoh licensed Floyd Rose with big brass block. As usual I tested the Titan bridge through my Blackstar HT-5 head, running into a 1×12″ cabinet loaded with a Celestion Vintage 30. Periphery are known for playing in an array of low tunings, but for this review I stuck with E standard and dropped-D tunings. Hitting up the dirty channel of the HT-5 and playing some chuggy chords I was greeted by a fantastic heavy percussive tone that hit like a hammer. The attack is super fast, perfect for tremolo picked riffs and phrases. Many high output pickups lack a bit of organic quality, most probably due to typically having a much higher resistance. Thanks to it’s relatively low resistance Titan has a real nice woody PAF vibe, albeit a bit more modern sounding. The low end is nice and tight, which of course works brilliantly on the low strings, and the high end has a nice sparkle which makes for an exceptionally articulate pickup, even under tons of distortion. Complex chords have excellent note definition, making each note nice and clear. Lead guitar parts sound brilliant with the Titan too. 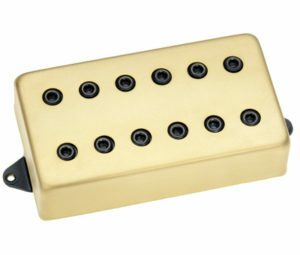 One of my favourite bridge pickups, the DiMarzio Dominion bridge is a pickup that sounds killer for rhythm work. Many have found that with it’s boosted mids it became too thin and shrill when playing lead parts higher up the fretboard. The Titan bridge is much more balanced tonally, so leads cut through the mix without becoming too piercing. The Titan bridge’s lower resistance means that pulling off harmonics and the like are a little tougher than some other high output humbuckers, but isn’t too difficult to coax screams out of the guitar either. Most players thinking of trying the Titan bridge are likely to be using a lot of distortion, so it’s a non-issue really. On the subject of it’s low (for a high output bridge humbucker) resistance, the Titan bridge cleans up beautifully when rolling off the guitar’s volume knob. The tone is sweet when strings are softly plucked, and a little hair is present when hitting the strings hard. The Titan bridge also splits well with a neck humbucker. I installed the Titan neck humbucker (review coming soon) at the same time as the bridge model, and the two split and combined create some amazing Strat tones. It works really well in a clean setting, being versatile enough to be used for blues, funk and more. It also provides a brilliant canvas for sound-scapes using various layered effects. With some overdrive it is perfect for screaming blues and most forms of rock. Overall the DiMarzio Titan bridge humbucker is a brilliant pickup that will not only satisfy the “djent” crowd, but also the greater rock and metal crowd. It’s ability to provide both tight muscular heavy tones and fantastic clean sounds makes it an extremely versatile pickup that works in a large variety of situations. If you are looking for a high output pickup that is tight, balanced and extremely focused tone that is also capable of providing fantastic clean tones definitely check out the Titan bridge. 2 Responses to "DiMarzio Jake Bowen signature Titan bridge humbucker – review"
I was thinking or getting a Seymour Duncan Custom for my Sg, but then I read your review and you got me thinking about the Titan when you said “Titan has a real nice woody PAF vibe, albeit a bit more modern sounding”. How do they compare tone wise? Well I was comparing the Titan against the Custom, and the Titan is very much like a more modern sounding Custom. They are both awesome pickups in their own rights, and either will work nicely for you.